This is part 4 of a planty series read parts don’t forget to read parts 1, 2 & 3 in any order. Tiny terrariums are my newest obsession. If you’ve been around these parts since the beginning you might remember my huge terrarium on a stand that I’ve had both inside and out. I found that it wasn’t bringing me enough joy for the amount of room it was taking up so I sold it a few years ago. When my boys were young we grew plants and my boys put their plastic dinosaurs in the terrarium–and anything they found on a nature walk usually ended up in there as well, since it was huge we could pop in pine cones or special rocks (maybe even a found lizard when the terrarium was outside). If you have boys, they will LOVE a large terrarium. 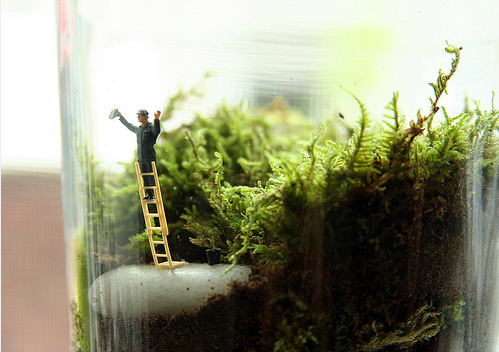 The best part about tiny terrariums is that they are a little micro world all their own. You can make them out of just about any glass container from a fish bowl to a wine glass to a light bulb. They are easy to keep alive especially the enclosed terrariums because they almost self water. And, my favorite part? 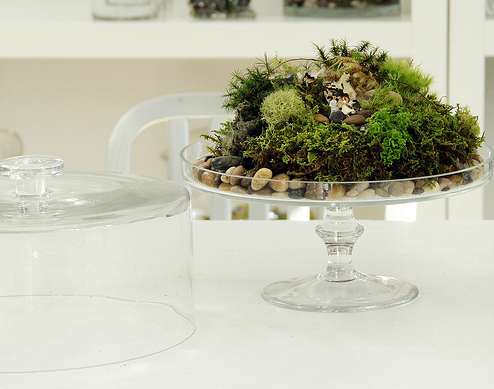 You can embellish your tiny terrarium with sweet little accessories. This is Tim Burton’s Beetlejuice Terrarium created to scale, complete with a hand made replicate of the Beetlejuice house hand painted (some parts with a ONE HAIR paint brush!) I die. 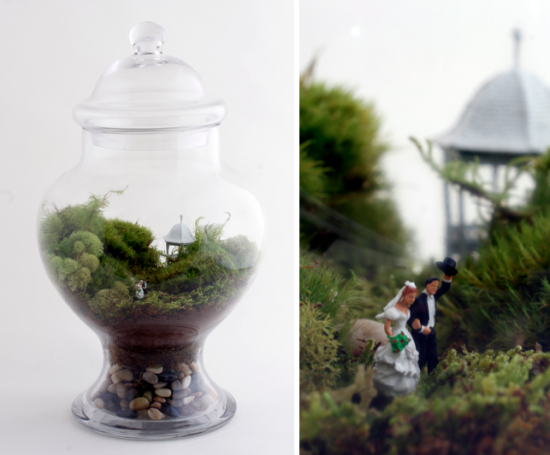 These terrariums are absolutely enchanting–see the tiny people in there? It’s their wedding! 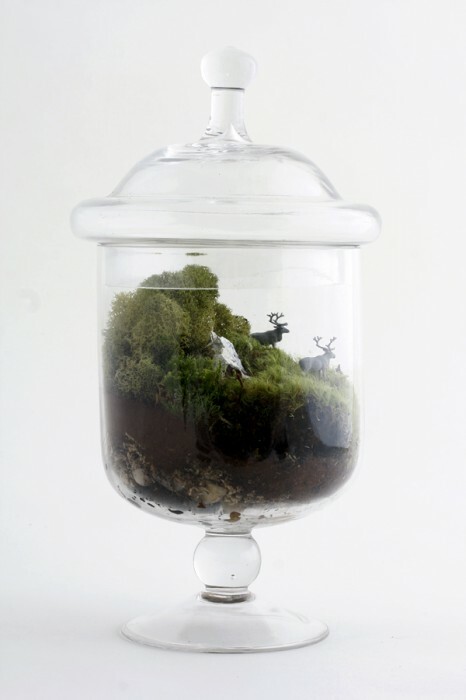 I think Twig has the most amazing terrariums to purchase and or be inspired from. I apologize because I realize after looking at these photos, if you are anything like me, you are now grabbing your keys, making a list and scavenging your home for terrarium parts. These photos have magical powers to posses one with terrarium cravings. 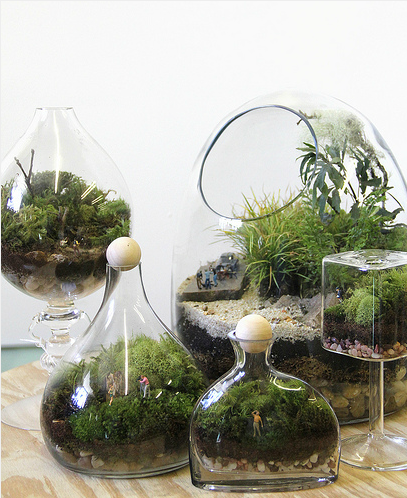 These terrariums are one of the most inspiring things I’ve seen a long time and are such quirky curiosities for all ages–and they are FUN and easy to make. 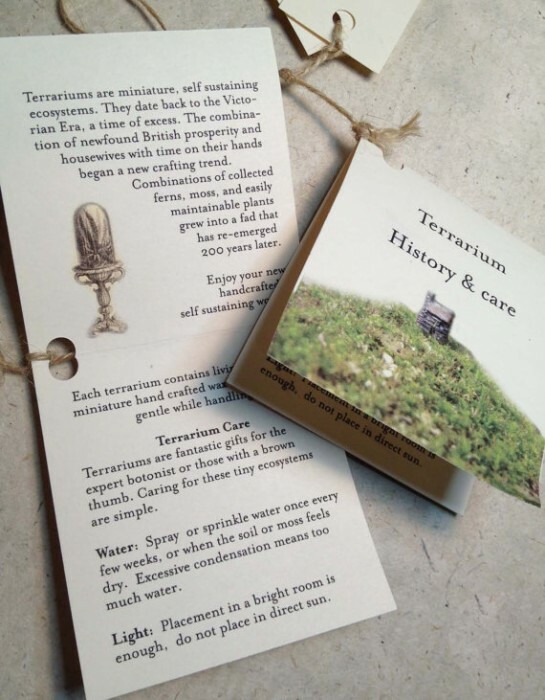 Do you have or want a terrarium? Any tips? Ideas? Places you know where we can get a miniature unicorn? Can you buy a little unicorn from a hobby shop? OR look online for one. That’s it, we are going to need a planty linky party next week! That is so funny on the timing of this post…as I just bought charcoal this morning to build a terrarium! I have been planning it for months and now I am just super excited to get it done!! Okay, I am totally inspired now! I haven’t been able to keep plants in the house because my cats think that any green things in pots = salad bar for them. 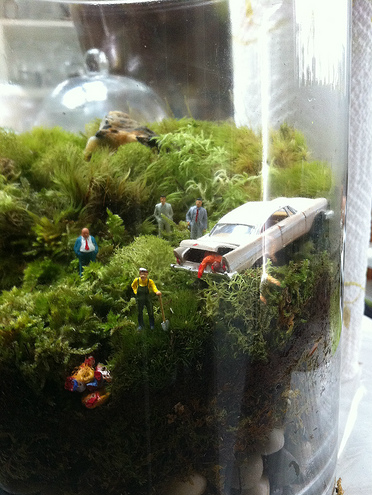 But a terrarium just might last, and I LOVE the idea of making miniature worlds in them. Guess what I’ll be doing this weekend! 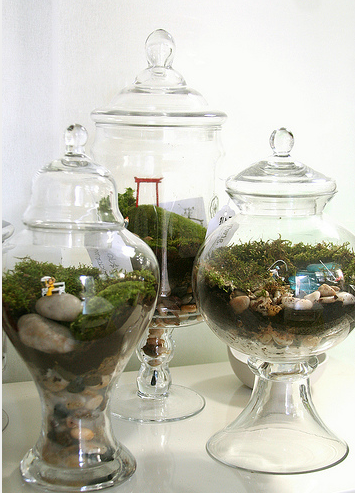 I did a couple of terrariums a few years back – I even had one in my office at work, which got alot of attention. They were really neat and so pretty – for a while. They can outgrow their container or start having problems. I had a hard time with humidity and finally got rid of them. “having problems” maybe get a terrarium counselor? I think I am so funny. 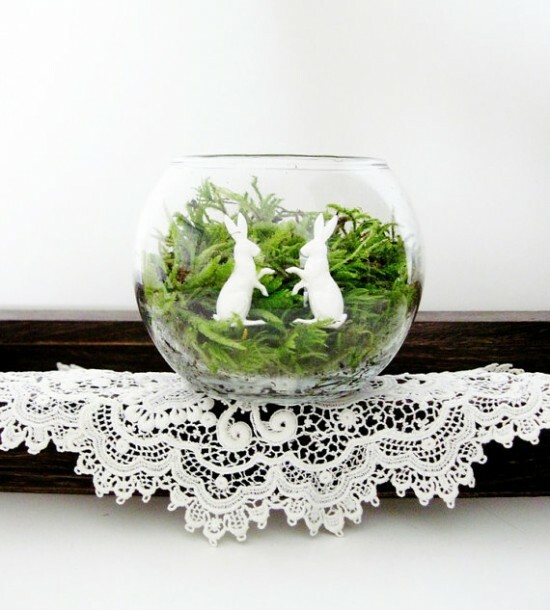 Ah Nester I want to see YOUR terrariums! I LOVE terrarium’s!!! Thank you so much for including ours!!!! 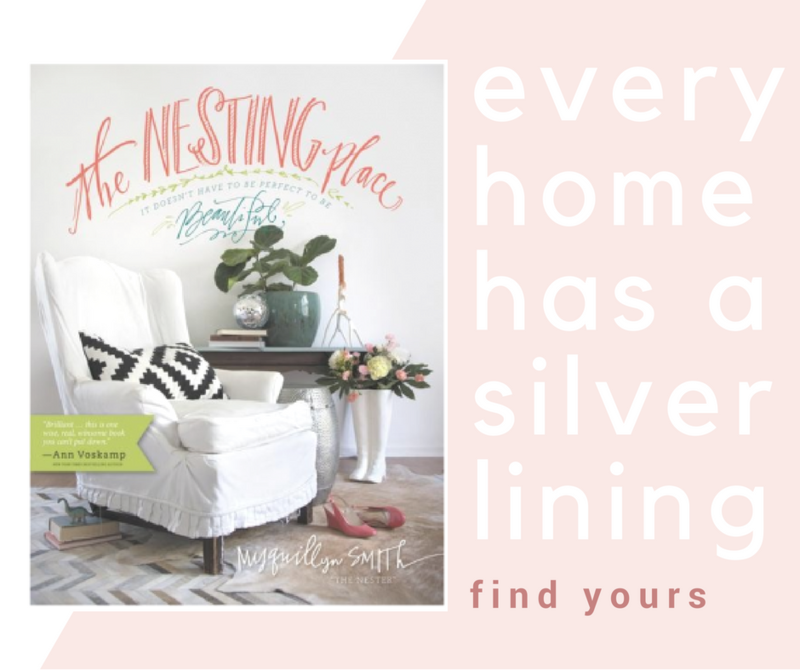 Wouldn’t that be a cute gift for either a Junior High girl ready to have a more mature bedroom or a gift for a college girl to give her a little piece of home and childhood memories? how timely, I was just now I was researching these! I know I’ll be at the home improvement store loading the cart with happy little terrarium plants! Is it better to have a jar with or without a lid? So want to try one of these! Thank you. Succulents and other desert plants should be open, and moss and other moisture-loving plants should have lids. 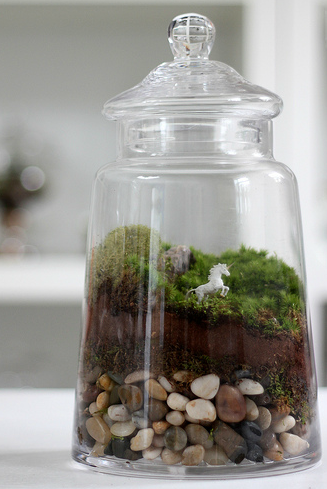 Now I have to create a terrarium of my fairy dreams complete with toad stools, butterflies, fairies and a unicorn please! All that mossy goodness is the perfect home for a fairy abode. What fun! Can they be any size jar? I just picked up 2 at the thrift store for $0.20 (they don’t have lids) and want to use them. Tomorrow hubs and I planned on hitting up our local nursery to talk about a natural barrier in the backyard instead of fencing. This gives me a chance to also look for terrarium plants! I have some little construction guys my 2 year old would love to see in them! I think I’ll make him a construction zone one! Thanks for the great idea. Also, did you put newspaper in one of yours? Is there a reason for it or just cool decor? It would be fun to have a person reading a book in that one… with a park bench scene…. my dream. 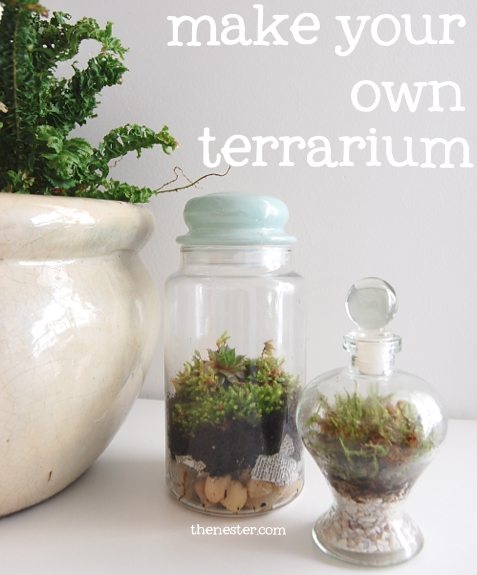 Approaching this post, I thought, now terrariums is something that I can’t spell on my own or keep in my house, but I’m a believer now! 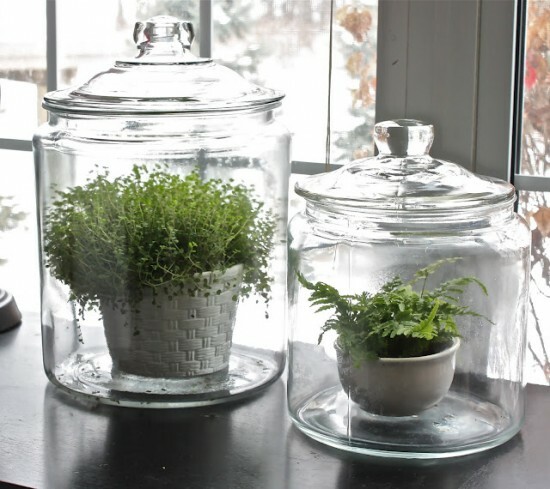 Ooh, I have a jar in my “use or sell asap” bin that would make a gorgeous little terrarium! I should make one! After our vacation next week ;-) Thanks for the gorgeous inspirational photos! if I do this with my son, I will count as decorating and homeshcooling? even though, this mama don’t homeshool. I do love your terrariums, but please don’t put a lizard in there…that would be cruel to limit his world to the size of a jar, for your entertainment, where he would surely die. I have really enjoyed this whole “plant series” of posts. I have been so inspired and now I want a terrarium! I know I will now be driving around looking for the perfect little jars to start one in. I am sooooo in love with ALL of these!! I can’t wait to make one or five. 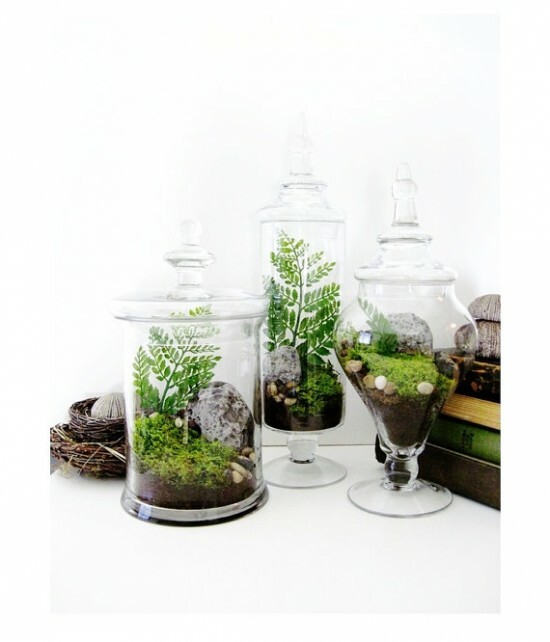 Maybe our may craft day should be mini terrarium day?! Hello Nester- I have heard of you often over at Chatting at the Sky, but this is the first time I’ve wandered over. I’m so glad I did! Am I reading right that you’re renting!?! 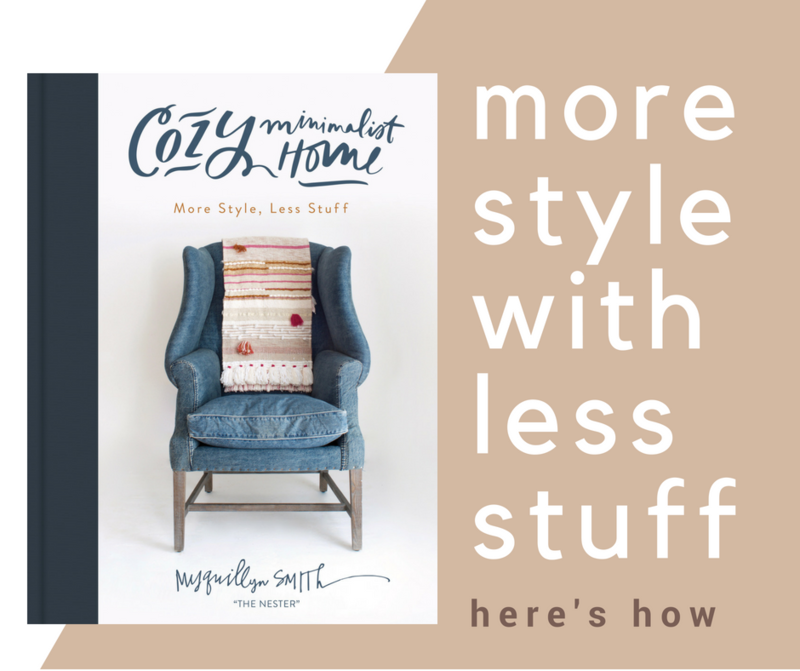 It’s fabulous to realize I can do amazing stuff with my rented space!!! I have a question about these terrariums though. I really want to make one, but I quickly kill every living plant I get- are terrariums easy to keep alive? Hey Jennifer! Yes, Emily and I are sisters!! We talk about each other a lot. I think if you find the right plants that work for you, terrariums can be easy and almost maintenance free, don’t be afraid to have a little trial and error and waste $3 here or there in order to find the right fit–it’ll be worth it in the long run. so glad you are here and Yep we are renting!! WHAT?! THAT terrarium is over 20 years OLD~Amazing!!! I really love this series. And I love that you keep on having more wonderful things to say about plants! I have a plant in every room now…plus I added some paper bunting and pin wheels! You have officially won me over with house plants!!! And after reading this post, I have some succulents that have not been doing very well…so I just put a mason jar right on top of them as a temporary terrarium to baby them back to life! Thank you for all the wonderful tips, research, and ideas! LOVE! I’ve tried terrariums a few times but they have always turned themselves into science experiments. Not good. I’m totally into this right now, too. So far, the only thing I’ve done is pin a bunch of fairy garden pins to Pinterest, but one day soon I’m going all-out crazy plant lady. 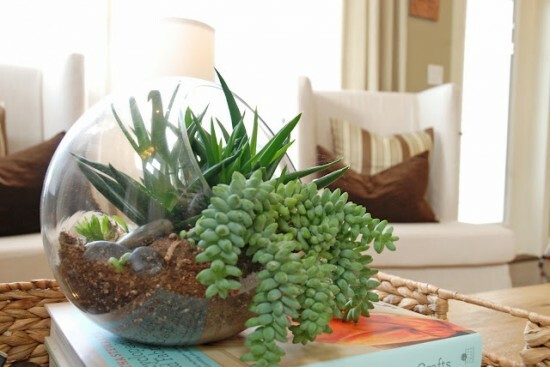 Terrariums seem to go in and out of fashion. It’s so cool that they are back in again and I especially love the embellished ones you have shown us. Wouldn’t a gift of one be nice fore someone special, featuring whatever that person’s hobby or special interest was? There is some logging work going on in the woods near me and a couple of weeks ago we decided to walk down the trail they have made deep into the woods. We found an old dumping site and judging by the bottles, it was from about 50 years ago. What was so much fun, besides the vintage items we found, was an old whiskey bottle laying on its side that nature had made a terrarium out of. It has tiny little ferns and moss growing in it. We brought it home and put it in our natural area and make sure to tell friends that we just don’t throw our trash out the back door. :) I was so excited to find that nature made terrarium, you would have thought I had won the lottery. Ack! These are so cute. My kids would love them. I need to try it. I must go dig up moss between the sidewalk cracks now. Bye! Last year, I made some “kind of ” terrariums and grew wheat grass in them for really fun Spring Centerpieces. I did it again this year and now I am off to refill them. The wheat grass is just about to die out, so this is perfect timing. I had a moss one. In Canada you cant seem to get moss in a garden centre (at least not where I live). I got some from my parents back yard 2 years ago and made a larger terrarium. Unfortunately my apothecary jar is not very deep so most plants wont fit. It lived for a year and a half before it kicked the bucket. Thinking of trying again, just never sure exactly what plants I can use. Omg looove! 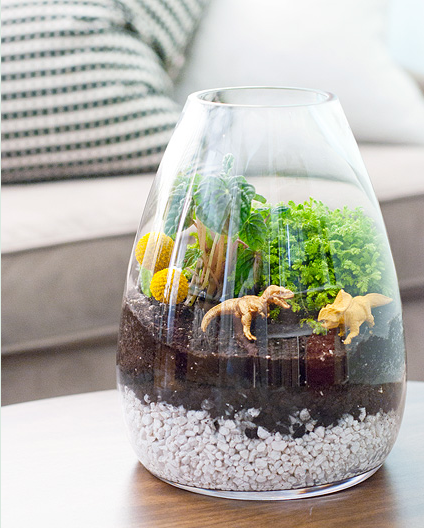 And if I get a tiny-hole terrarium…my cat and/or toddler can’t play in the dirt and/or eat the green parts. Woohoo!! And I’m loving the little man on the ladder cleaning the glass. Hehe. I loooooove terrariums! Think I’ll work on putting one together this weekend! 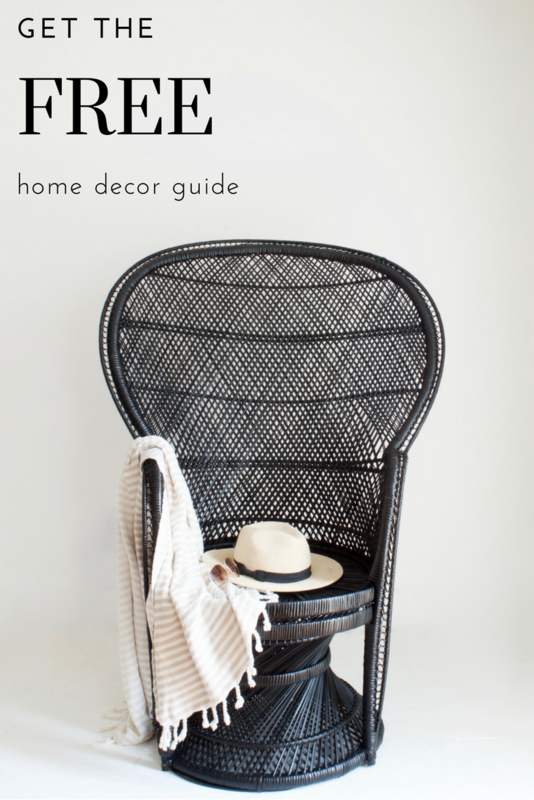 Thanks for posting the ‘how-to’! Stop!!!!!!!!!!!!! these are driving me mad!!!!!!!!!!!! I NEED THEM – ALL OF THEM – ALL OVER MY HOUSE!!!!!!!! I’ve always loved terrariums, but never have grown one. Now I WANT to. I still have a few plastic army troopers left behind by my sons. 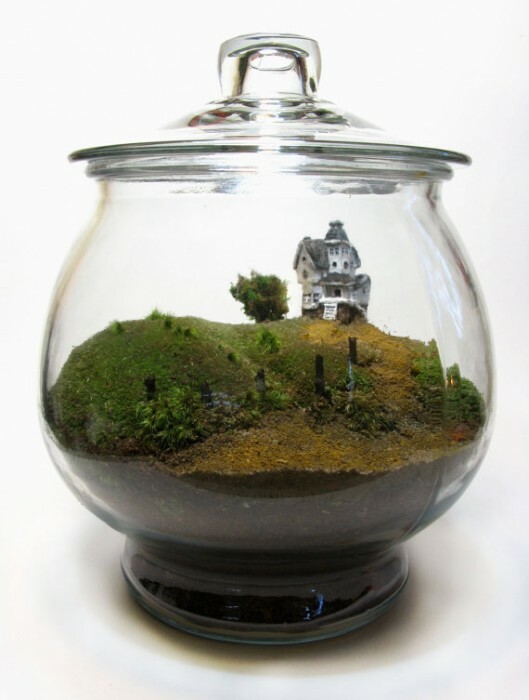 How about a combat zone terrarium? I heart terrariums! I make them and give them as presents. : ) Super fun and cheap. I add a little ribbon to the glass and don’t even bother wrapping it more than that! I remember making a terrarium in 4th grade and thinking it was the coolest thing ever! I loved going to class everyday and looking at it. I think this will be a great project for my kiddos ages 5, 2, 2 to do. Oh… I am excited about this. This looks like it doesn’t require a green thumb!! I love it! My grandmother always kept one and it fascinated me. I would love to have her groovy sixties aquarium right now. As for the little figures, my boys have collected a few from those little quarter machines at the grocery store. The FEW times I have caved and let them get something, they have gotten little figures. We’ve got a tiny little deer and a few others floating around here somewhere. Wow, thanks for the inspiration! 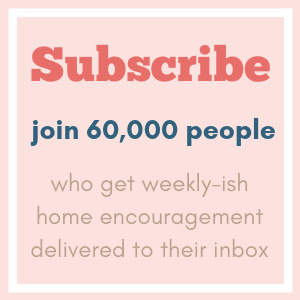 I have been stumped on what to do for my sister’s 50th birthday. She went to Ireland last year and now I have a fabulous idea….a terrarium for her to keep at work (she spends too much time there) that is made to look like that beautiful country. I see moss on my morning walks with the dogs. Looks like I will get busy making this…her birthday is in May. I am however having a lot of trouble finding the little people to put in my smaller ones. A site that i have found sells them at about 3″ tall (which is to big for small jars) is there anywhere that sells really tiny ones? 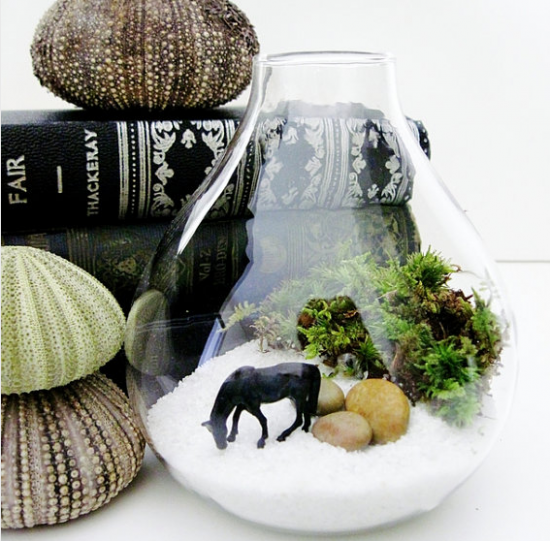 Aren’t terrariums so beautiful & fun?! love this selection! P/s: I’m in the process of translating all my post to english … I’m on it! but takes time! 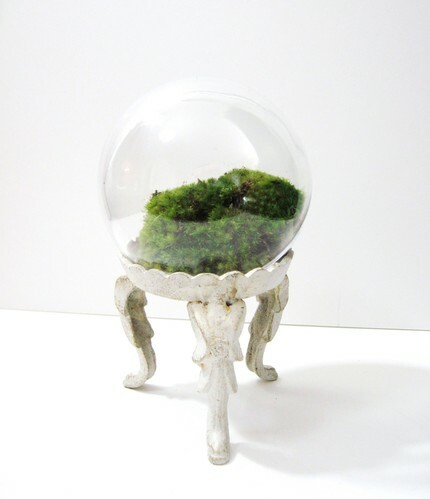 So thrilled to find this blog covering my newest venture to create my own terrarium. 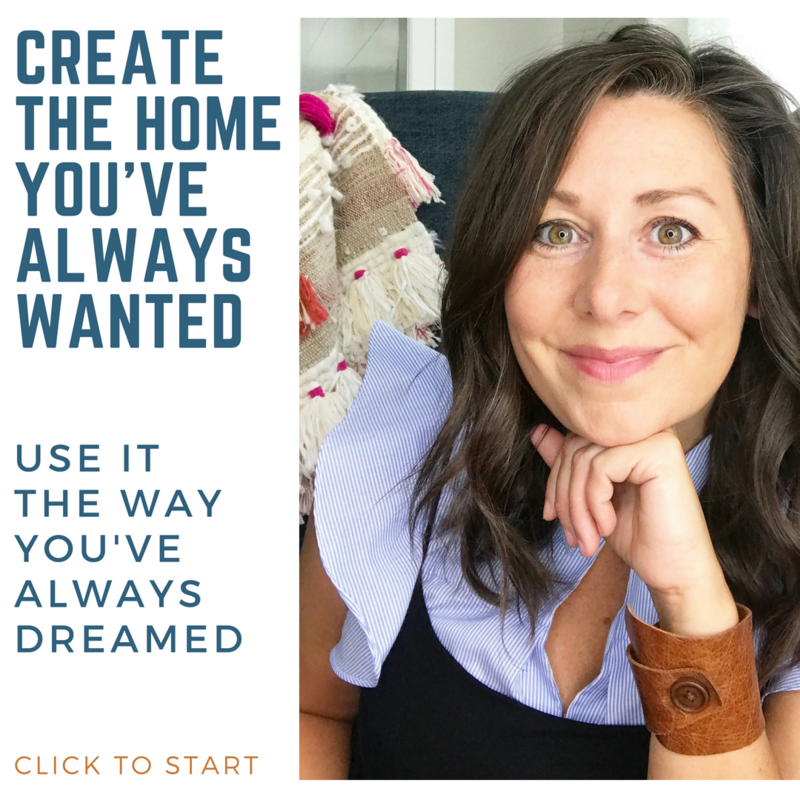 I am so excited to get started, and this page is chocked full of inspiring ideas and offers such great tips/suggestions. Thanks! Check e-Bay for HO figures. Look through the results to find the unicorn, mermaids, fairies and the same figures Twig Terrariums uses.